De HollandseManege or the Dutch riding school is located behind the 19th Century townhouse close to Amsterdam central park. 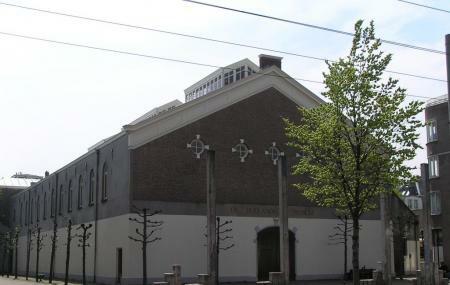 De HollandseManege is an active horse riding school which was established in 1744. The building of the place was built in 1882 and is in neoclassical style. The building was renovated in 1986 and has been kept well preserved since. So visit the destination and learn how to ride the horse in perfect form. Be careful while riding the horses. Take a tram or bus from Amsterdam, Overtoom. Take a tram from Amsterdam, 1e Con. Huygensstraat. Take a tram from Amsterdam, J.P. Heijestraat. I used to ride here for a year before last summer. The horses are nice and the teaching is mediocre/good. However, I could not continue for moral reasons as the horses do not go out during the year. In the summer, they have a short break, but this is not enough. If you're looking for a riding school, I suggest looking slightly out of Amsterdam city centre as horses are much better cared for. For example, De Amsterdamse Manege in Amstelveen is very close and the horses are well cared for with excellent teaching. People are so friendly, and the building is veeeery beautiful, but that is all! It is old, the horses never go out in the street, they don't have a paddock or something, they are dirty and kept without shavings, just on straw... many of horses are just tied all the time... don't go there if you love horses. Super location. Great instructors and horses! Simply amazing! Everyone very friendly. Yes, there is a need for renovation and those who have complained about it need to maybe make a donation for those renovations. I was allowed to go through stable and pet horses when in States it would have been prohibited. Beautiful location and makes me wonder what it must have been like when horses not cars ruled our cities. Yes it smells old but that is history. Yes it smells of horses but it is a stable. If you are a true horse lover and rider you will respect and appreciate.